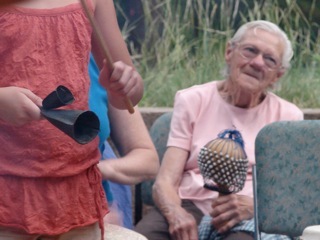 Drumming on this planet has had many functions over the centuries: As communitcation, celebration, work, war, and probably the least explored - meditation. When one thinks of drumming it's usually in a loud, bombastic setting. However, here at Community Drums we focus on the quiet side of the drum. In particular, the West African djembe drum, though any drum will work. 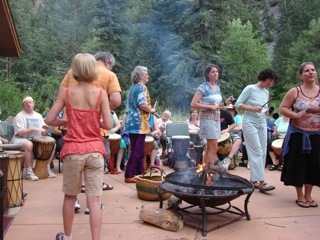 Quieting the mind so the vibration of the drum can affect one is a most satisfying experience. 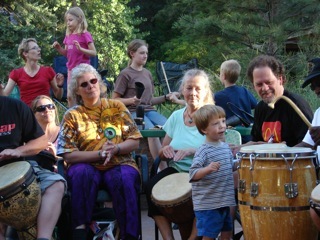 That is what Community Drums is all about. My classes engage the mind at first with the intention of passing the information to the hands. Once the elements of a rhythm are practiced a meditational state can occur. Ultimately, the quiet mind along with the vibrating drum can merge. To get to this spot - I have a process of learning any rhythm to get anyone there - whether you have musical experience or not! After playing the rhythm in each of these elements with all the possible permutations we put it all together and then play it for at least 10 - 20 minutes. This is where the meditation truly can happen. 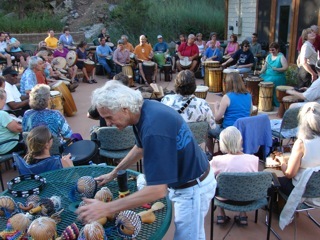 All Djembe Drumming Classes are in Longmont, Co. REGISTRATION IS THRU THE LONGMONT REC. CTR. & DUE BEFORE FIRST DAY OF CLASSES each month. Either call: 303-651-8404 - OR in person at St. Vrain Mem. Bldg. / 700 Longs Peak Ave.
Register BEFORE first day of session per month. Join us on Facebook for updated photos and videos.